Every once and awhile as time and creativity permits, I try to participate in a challenge. I have had this stamp from Art Impressions sitting in my "to do" box for a couple of weeks now so I decided to see what the current challenge is on the Art Impressions blog. Art Impressions Challenge #212 is Bling, Glitter or Glossy. For me, this was the perfect challenge to finally ink up this stamp! I LOVE going on shopping sprees or to a craft show with my crafty girlfriends - there is nothing I enjoy more and we always have way too much fun!!!! Is there such a thing as too much fun?!? After colouring my stamps with alcohol markers, I hand fussy cut my images and ran a black marker around the edge to clean up any white I had left behind. 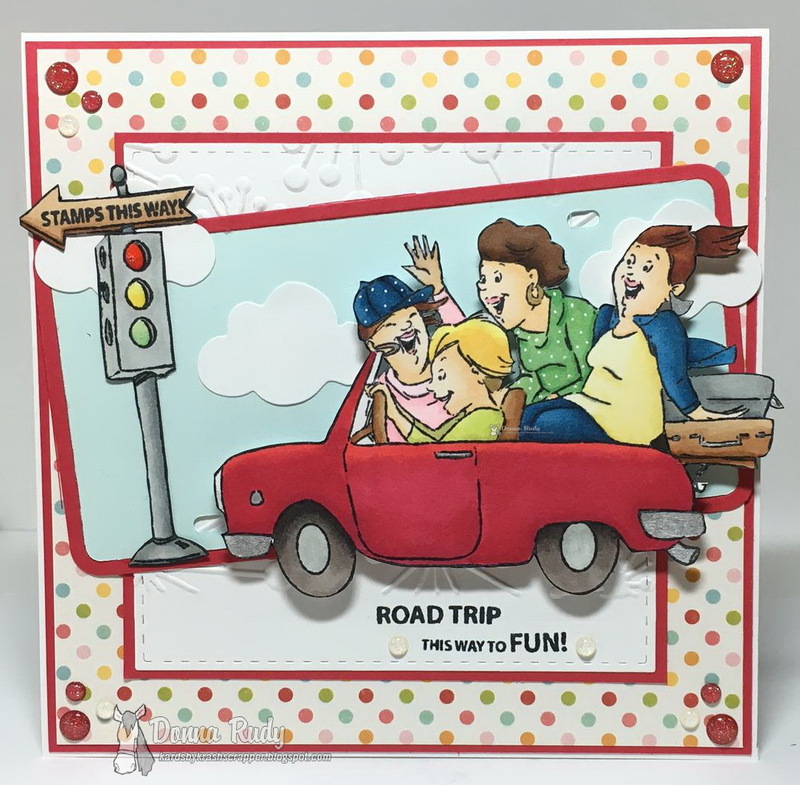 I cut my licence plate background out - perfect for a road trip card I thought, and added a few clouds. Gold and silver Wink of Stella on their earrings, sparkly silver gel pen on the cars bumpers and door handles, glossy accents on the stop light and some sparkly gumdrops gave me lots of opportunities to meet this challenge. 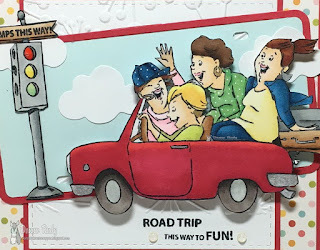 I used two more sentiments from this set and added them to a background piece of white cardstock that had been run through an fun embossing folder. I purposely left some white space at the bottom so I could put the sentiment on some flat paper. 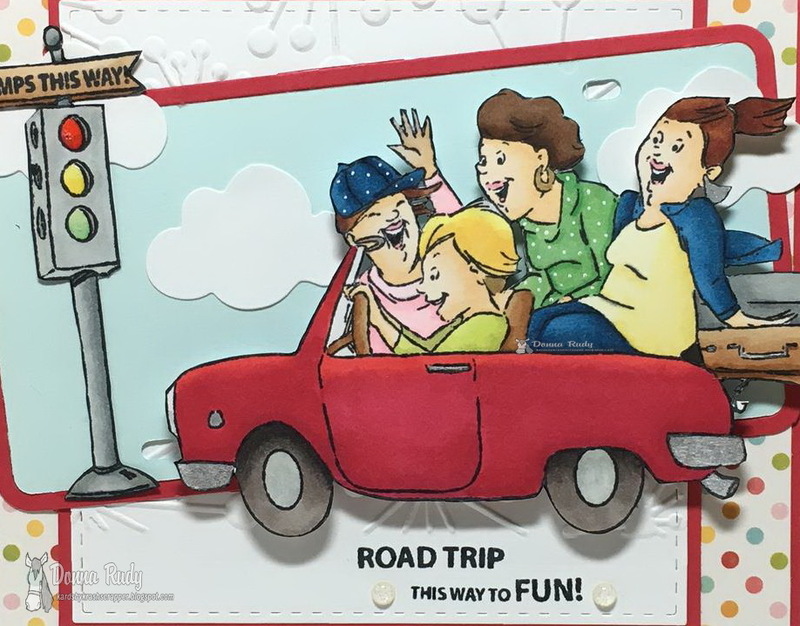 I popped the main image up using foam pop dots to add a bit more fun to my card. Once again another awesome design!! Love your colouring and you are the fussy cutting Queen!! Love that licence plate die too! Everything came together perfectly!! Super cute! I love the sky and cloud background and the whole layout! Thanks for joining us at Art Impressions!